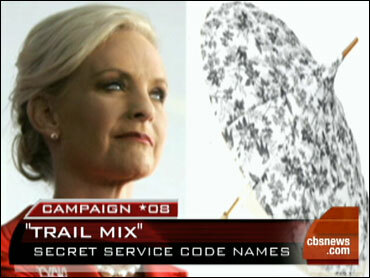 It's a time honored tradition of giving secret code names to presidential candidates, their running mates and spouses. So what are they known as on the trail? The Early Show political consultant Laura Schwartz spills the beans in a new series, "Trail Mix." Schwartz said that these code names used to be secret, they were the secret codes used to protect the movements of the candidates. Now that the Secret Service has more secure communications, we can talk about the code names more freely. The military-run White House Communications Agency comes up with the names in coordination with the Secret Service. Here's a look at the code names the candidates and their spouses have been given. Note that each couple's names start with the same letter. "Phoenix makes sense for a couple of reasons," Schwartz said. "He's from Arizona, represents them, of course. But also the mythological creature the Phoenix, rose from the ashes. So you think about 2000, 2008." "Cindy is really glamorous, she is also very prim and proper to some extent, so, they went with Parasol," Schwartz said. "Going against the conventional," Schwartz said. "Trying to have this change campaign, a new way to run the world." "For, a renaissance woman, came from the South Side of Chicago, got a great education, has beautiful clothes, I mean really a classic woman in design." "Well, Joe Biden's code name is not Celtic for the Boston Celtics," Schwartz noted. "It's actually Celtic with a hard 'C' and he's Irish so they went with his Irish connection." "She happens to be Italian, they have to go with a C for Celtic - they went with Capri," Schwartz said. "Named after a state park up in Alaska," Schwartz said. "It's the largest mountain in North America," co-anchor Harry Smith pointed out. "Formerly know as Mount McKinley, it's Denali." "He's up there on the North slope, so again, kind of creative, they have a good time with it. And you know they kep it for all the family," Schwartz said.